GIRO'16 St.20: Race Report: Vincenzo Nibali staged one of cycling's biggest comebacks on this penultimate day, attacking race leader Esteban Chavez inside 20km and storming to a commanding lead as the race is all but over. We always knew today would sort out the final placings on this year’s Giro and the riders didn’t disappoint. Staging one of the most remarkable recoveries in the sport Vincenzo Nibali played all his cards to perfection and rode away from Esteban Chaves to take this race by the scruff of the neck and write himself into the history books. The day belonged to Rein Taaramae as he rode a superb stage but all Italian fingers were very firmly crossed that their champion could once again show his class…and show it he did in the most superb style. "It was not easy at all to go in the break. Honestly, I suffered a lot in the beginning. I even dropped a few times from the break but everytime I was able to come back. I did everything to go on on a regular pace and that worked. I know these climbs very well since I did a lot altitude training camps here. From those camps I also learned that I become better the higher we go in the mountains. I found my moment to attack and I went away. I took my rhythm and was able to create a gap. The last two kilometers were really hard, I had strong cramps, but I went until the finish and won. This victory is very important for me but also for the team. I am super happy and I still can't believe it. What a day!" - said Rein Taaramae. 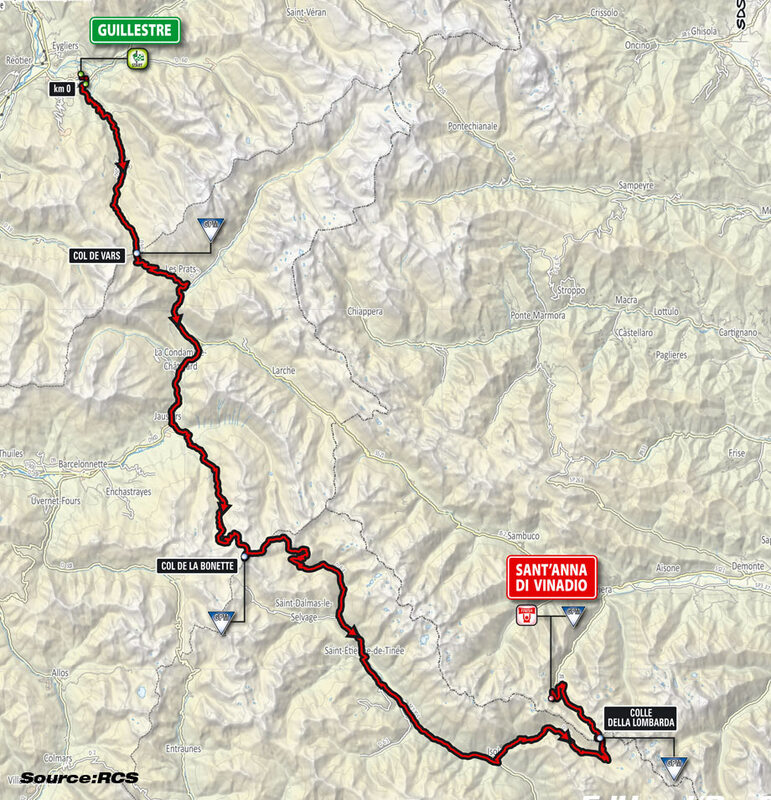 It was Stage 20 from Guillestre to Sant’Anna di Vinadio and a relatively short day at only 134km as the race headed out of France and back into Italy…but the riders had to get over four mountains with three long descents in between. And the mountains were fearsome including the Col de la Bonette at 2715m. Climbing from the flag rider after rider tried to literally get up the road. Mikel Nieve (Team Sky) was the first to go and he was followed by Damiano Cunego (Nippo-Vini Fantini). The bunch was strung out and the first real action was when Alejandro Valverde (Movistar) nipped away from the pink jersey group of Chaves (Orica-GreenEdge) and Nibali (Astana). Always a trier, he was never going to get away with that and Astana brought him back into the fold. Eventually a group of eight formed up with Nieve being the most dangerous as he looked to gain KOM points. With the break now established it was misfortune once again for former Giro winner Cunego as he’d missed the bus. His two main rivals were there with Nieve and Stefan Denifl (IAM Cycling) looking to fight it out in the mountains classification. The leaders were: Mikel Nieve, Joe Dombrowski (Cannondale), Stefan Denifl, Tanel Kangert (Astana), Giovanni Visconti (Movistar), Darwin Atapuma (BMC), Gianluca Brambilla (Etixx-QuickStep), Rein Taaramae (Katusha), Aleksey Rybalkin (Gazprom) and Alexander Foliforov (Gazprom). Foliforov jumped out to take the intermediate sprint at Station de Vars and it was onto the summit where Denifl made sure of maximum points as the break went over the top. Nieve came over in second to keep this classification alive with Cunego having 134 points to Nieve’s 110 and Denifl’s 108. All quiet as the leaders and then the bunch sped on down to the foot of the Col de la Bonette, the gap sitting around 7:30. As the leaders hit the initial slope of the Bonette, first man to show was Nieve as he set off on his own, looking for those all-important mountain points. Having lost out to Denifl on the Var he wanted to make sure of it over the top of this beast of a mountain. Sitting at 2715m, 22km long with an average gradient of 6.7% but rising to a maximum of 10%. News was just filtering in to the pressroom of a huge crash at the Tour of Belgium, apparently caused by two motorbikes and resulting in the stage being abandoned. The UCI surely will have to step in to this on-going situation now. Pushing onwards, Nieve now had a gap of 1:20 over the other chasers but, not content with the Spaniard riding away, Atapuma set off in pursuit taking Visconti and Dombrowski with him. Foliforov, alive to the move, quickly joined them. With Atapuma pushing, and pushing again, the chase group was reduced to just two with Foliforov along for the ride. They began to cut Nieve’s lead but not by much as the Navarran headed for the summit. Running out of steam they were soon back with the other chasers. In the bunch behind, Movistar had hit the front and were beginning the thinning-down process as riders were shelled out of the back. Nieve was now above the snowline and heading for the summit of the climb that was just 26m short of yesterday’s Cima Coppi where he took 35 points and the lead in the mountains competition. With Taaramae coming across in second and Foliforov taking third it was looking good for the Team Sky rider. A lead over the main peloton of over 10 minutes meant that today’s winner might well come from the escapees’ group. Team Tinkoff had turned up the heat and stretched the main bunch and now Steven Kruijswijk had been isolated as Majka looked to pressure those GC riders ahead of him. Nieve was taking it easy on the descent and was probably hoping that the chasers would catch him and provide some assistance on both the Colle della Lombarda and the climb to the finish at Sant’Anna. And sure enough he looked over his shoulder and saw his erstwhile companions coming back to his wheel…seven riders in front of the main race with 45km to run and 8:40 to the good. Brambilla, who had lost contact on the climb, was chasing behind the break at 1:02. With the Italian chasing hard, and the break rolling along, he made it back into the group with time for a rest before the road bent upwards again. The two saddest guys at the Giro - Chavez & Kruisjwijk are shepherded home by Scarponi - who helped engineer their demise. Into the small town of Isola and Visconti rolled through the sprint point in front of Kangert and Dombrowski but they were more intent on position as the climb started immediately afterwards. Dombrowski forged ahead and got a gap but Atapuma crossed the distance as they went through the hairpins and Visconti was fighting to get on terms as the chase group began to fragment behind. Orica’s Basque import Amets Txurruka was controlling the peloton some 10:38 down as the big names began to eye each other up. A huge effort from Visconti and then there were three. Scarponi was with Nibali and Majka’s teammates were massing at the front at the bunch as poor old Cunego slipped away and lost contact. Something was bound to happen and the tension was obvious. 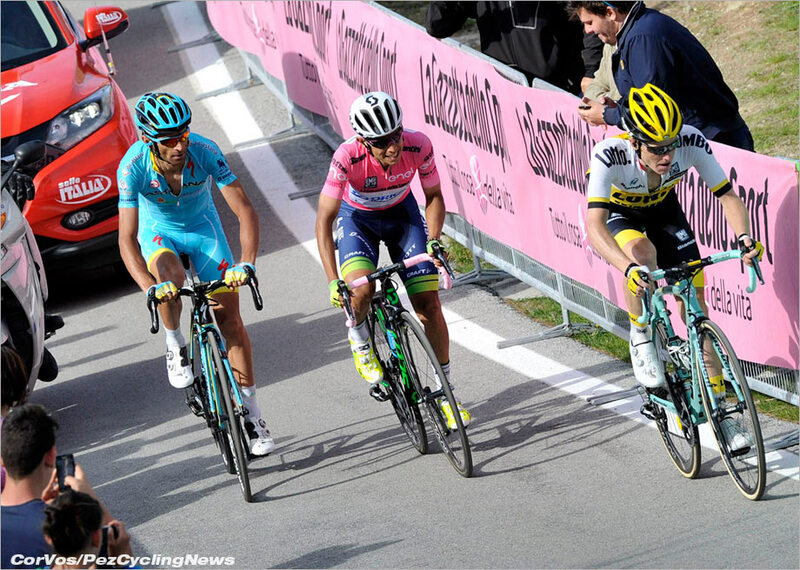 It was the last chance to turn things around in this Giro and some riders were going to give it everything. Astana once again pushed the GC bunch and it was soon going to be all the main men with just one or two support riders. Chaves was on his own but he’s used to that with Nibali still having the most domestiques about him. The three leaders had now been joined by Taaramae and Kangert with Nieve struggling to get on terms. Atapuma was keen to push on but he was getting little help from the others. Fuglsang had done his work in the bunch and now Scarponi took it up… and attacked straight away taking Nibali with him. Chaves, only having to watch Nibali, was on him instantly and it all slowed down again. This was the Astana plan then. Attack and attack again until Chaves was distanced… if he could be. Taaramae put in an attack and headed off up the mountain while Kangert sat up and looked like he was waiting for his team leader… and at almost exactly the same moment Nibali attacked Chaves taking only the Colombian and Valverde with him. Majka, Kruijswick, Jungels and Uran couldn’t keep up and with Nibali driving on, daylight appeared between him and Chaves… and he had the gap! Always keen to attack a man when he’s down, Valverde came off Chaves' wheel and left him behind in pursuit of Nibali. Chaves was struggling while Nibali set about taking back the 44 seconds he needed and with Kangert waiting to help him, he might just have been able to do it. Chaves began to recover a little and worked his way back to Valverde’s wheel while up ahead Nibali had linked up with Kangert and had some much-needed help. 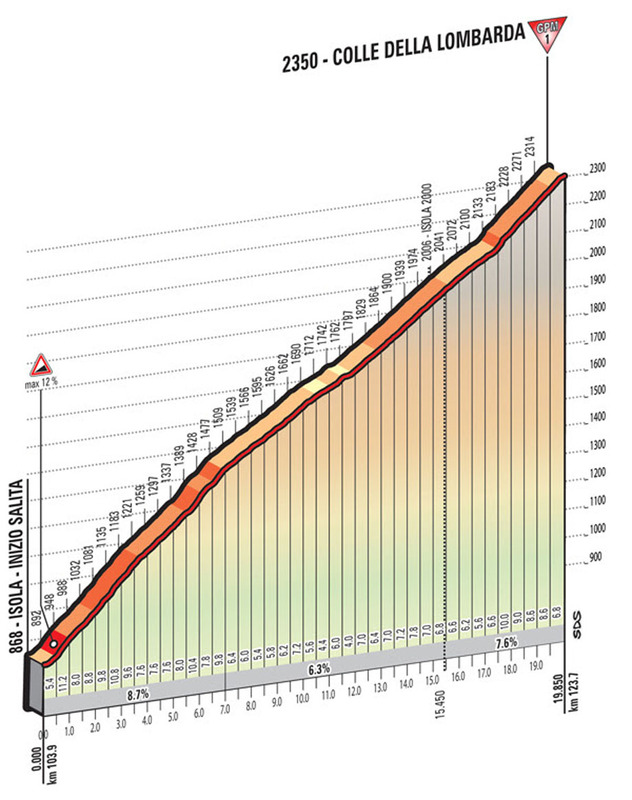 Almost forgotten, Taaramae had crossed over the top of the Lombarda and taken the Giro back into Italy with only a sharp descent followed by the short climb to the finish to go. Uran was also now back with his countryman and helping Chaves to close the gap to Nibali but the Italian had used up his teammate and was on his own with 30 seconds in hand. This was the final bid to win this Giro happening on the slopes of the Lombarda. Nibali was a man restored and Chaves had lost the wheel of Uran and was possibly riding himself out of the lead and the overall win. Valverde and Uran were heading to the summit while Chaves was being caught by the Jungels group behind. Nibali had 55 seconds as he crossed back into Italy and he had taken the lead of his home tour, assuming Chaves couldn’t recover the time in the last few kilometers. Up ahead Taaramae was heading up to the finish with Atapuma chasing, having distanced Dombrowski but nobody was going to catch the Estonian rider as he came inside the final km. Nibali was flying down the short descent and ripping time into Chaves, who must now have known how Kruijswick felt yesterday. With Atapuma closing in on the lead, the man from Tartu in Estonia had time to sit up and cross the line, arms held aloft and take a great consolation win for the Russian squad. All eyes were on the Italian champion as he headed towards the finish in his attempt to take quite possibly the best Grand Tour win of recent years. Nibali was climbing through a tunnel of Italian fans as they went wild in support of their champion. Behind, Scarponi was giving high fives to everyone as he had helped to orchestrate one of the best moves of any recent race. Nibali had tired on the final run-in and Valverde and Uran crossed the line just 10 seconds in arrears…but there was no Chaves as everyone started to count. Ironically, the Colombian was struggling to stay on Kruijswick’s wheel as they headed for the line and he eventually crossed over a minute back on Nibali. To make matters worse, Scarponi had shadowed him home and punched the air as he finished. 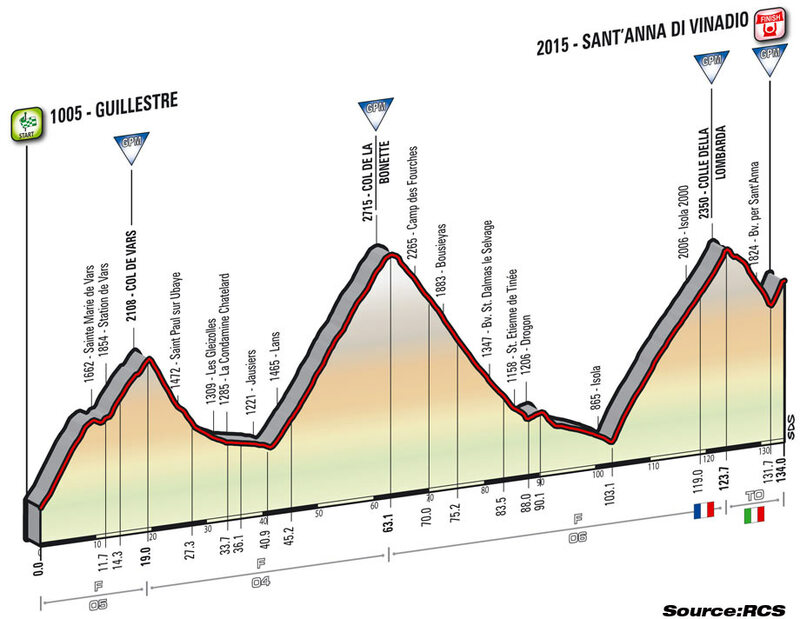 Nibali was now the Maglia Rosa with only the parade ride into Turin tomorrow to go. Having been counted out only a handful of days ago, the Italian staged a remarkable comeback to not only finish respectably but to blow this race apart and end the day on the top step. The stage belonged to Taaramae but the man on the front pages tomorrow will be Nibali. Keep it Pez for all the crazy roadside action from Ed.